"keep your eyes on the road!" is often heard in the car when i'm at the wheel, and somewhat more so when driving on left side of the road in a manual shift diesel rental on the narrow New Zealand roads. I tend to rubberneck to see not only the landscape but also any eye-catching buildings. So it was when we motored around Wanaka, a growing community in a stunning landscape in the Southern Alps at the shore of the lake of the same name. There are quite a few unique "bachs" (rhymes with 'hatches') hatching along the lake; some clearly designed by inspired architects. I pulled the truck over to check out one under construction, a clearly articulated rectangular volume with an inverted hip roof sloping inward to a central courtyard from high perimeter walls. 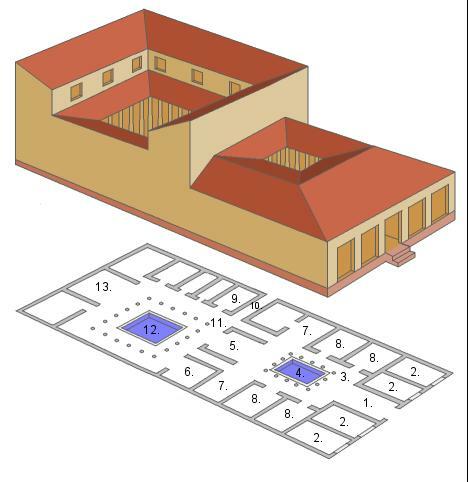 The scheme immediately recalled Roman atrium houses, organized around a central court with an impluvium, though made of red wood cladding and metal roofing, rather than stucco and red quarry tile. One corner of this tight rectangle is left open, revealing the inner courtyard and entrance, and providing garage access at the flat ends of each wing. While most bachs are compact volumes organized with interior spaces focused on views to the spectacular surrounding landscape, this building adopts the inwardly focused model of spaces organized around a central courtyard. Like a Roman house, the exterior walls are tall and mostly opaque, allowing for abutting houses to share a party wall, while maintaining privacy. Daylight in Roman houses was mostly admitted via openings in exterior walls to the inner courtyard, or atrium. "You're trespassing again!" came calling after me as i walked up to have a closer look (another habit that sometimes annoys my fellow travelers). Yes, i thought, but it's under construction and noone is here, and i can plead innocent architectural curiosity, no? Instead of simple impluvium and planting urns sporting young carved nymphs, the courtyard was in process of becoming a more complex environment with concrete walls and steel frames - I'll want to return to find out what they become. But more striking was the transparency, not into the interior rooms, but through them to the landscape beyond. Transparency from courtyard through spaces to landscape beyond. Roman house courtyard with peristyle colonnade and in-sloping roof. So, unlike the rooms in the Roman house which open only onto the atrium or courtyard, this home wants to have it all. the intimacy and privacy of an enclosed court and the extensive sweeping views of a modern villa. The tension between these two powerful types becomes evident when i toured around the sides of the building away from the street and towards the landscape beyond. here the taut vertical siding starts to erode and reveal transparent glass. The erosion and inversion of wood to glass is nearly complete as the wall reaches the furthest corner. Wanaka Bach with opaque "party wall" progressively eroded towards outer corner and views. Does it work? One of the powerful aspects of the Roman house is the clear distinction between public and private and it's reinforcement in the architecture. In a dense urban fabric, an atrium house might have one relatively mute facade facing the public street, with a public entrance. Passing through a compact entrance, and relatively dark flanking spaces, one is focussed on the atrium, open to the sky. The simplicity of bright sky and relative quiet must be in high contast to the noisy, chaotic public street, rendering a level of calm associated with a private house. For those admitted deeper, the central courtyard with surrounding peristyle was probably even quieter and more serene. with a interior rooms ranged around the court. the gradation of interior to exterior, dark to light, and private to public would take on a more subtle but still powerful presence. I wonder whether these characteristics, fundamental to the architectural language of the atrium type, are so diluted in the Wanaka bach as to render the basic moves questionable. For example, do the higher ceilings at the perimeter afforded by the roof pitch make for better spaces? do higher volumes with pervasive glazing at the perimeter undermine the power of the courtyard? I would love to go back and knock on the door and see if the owners will forgive my trespasses and let me have a look around the finished beauty.